If you are in Japan and have not decided where to go during the long week off in May (Golden Week), Nagasaki may be the spot. 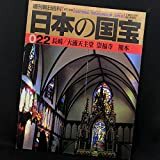 I have procrastinated for almost one year the post for our visit to Oura Church, the national treasure, and the Glaver Garden. They both constitute the assets recognized as the UNESCO’s World Heritage, as will as Japan’s National Trasures. It is really worth visiting them and so many other historical monuments, especially if you have some insights in the dramatic history for 15-18th centries. Even if you have no knowledge of its history, you can still time travel in Nagasaki.